Note from the LeftEast editors: this article was originally published in Serbian at Mašina. Rs . It was translated into English for LeftEast by Vladimir Unkovski-Korica. The commemoration of the October 5th Revolution on its fifteenth anniversary has been reduced to a marginal event. One public meeting, several round tables and an equally small number of statements and wreaths, were enough to generate a couple of boring media reports about the importance of this date. Few mourn before the faded image of October 5th, least of all the once divided political elites who today all serve the same economic elites, and, pooling their forces, continue to implement neoliberal reforms. Every nation has its Bastille Day. The efficient management of a society divided into opposing classes needs unifying myths, polished memories, and accompanying festivals of pathos, lifted to the level of commemorations fuelled by expensive cognac and cheap patriotic poetry. Those are the days when we remind ourselves – all of us who are on a fundamental and everyday level excluded from political life – of the myth of all myths: that one which sees the nation gathered around common ideals and aims, which it is necessary to continually defend, or for the attainment of which it is necessary to continue to struggle. November 29th [translators note: the date of the foundation of the antifascist republic of Yugoslavia during the Second World War] has left behind only a notorious police station. October 5th is now our sad Bastille. 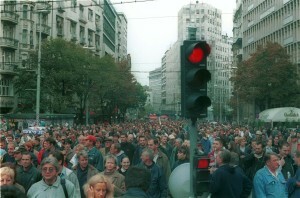 If there were an official version of the history of October 5th, it might briefly sound a bit like this: on the 24th September 2000, an opposition coalition finally defeats Slobodan Milošević in federal presidential elections – Milošević refuses to concede defeat – angry, citizens flood the streets on October 5th, burn the Parliament and reaffirm the victory of the opposition. Latinka Perović, the leading ideologue of the euro-integrationist movement, sees the epilogue of October 5th as Serbia’s missed opportunity to, with great historical delay, begin the process of modernisation – in translation, to set up a regime based on liberal democracy and free markets, and thus enter the world capitalist economy. Why Serbia’s missed opportunity? Because the compromises made in the years after the revolution brought about the murder of the leader of the modernisation process, Zoran Đinđić, and afterwards catapulted to power various governments not up to the task, or – as with the government of Vojislav Koštunica – actively obstructing it. According to this interpretation, the counterrevolution begins with the assassination of Đinđić. The story, thus told, contains all the mythological elements of historical textbooks: the heroic struggle for justice, the unrepeatable personality who embodied that struggle, that person’s tragic death, and, with that, the defeat from which it is difficult to recover. The initial plan was to stir up those sectors of the working class that were in any case inclined towards strike action, and to the opposition, largely consisting of those in the public service sector: in schools, hospitals, transportation companies. Columns would arrive by Thursday to Belgrade and for four days camp out in front of the Parliament and around it, forcing the regime to withdraw. The first step was for a general strike to be called on September 28th, which would be held on October 2nd. Already on the following day, the miners of the Kolubara basin went on strike. This rebellion in the ranks of what was once Milošević’s stronghold, where at that time 7,500 workers were producing 50% of the country’s coal, instantly disturbed the balance of forces. Soon, they were joined by the Pančevo refinery, the miners of Kostolac and Majdanpek, and many others. Kolubara was to that extent central that Milošević sent the chief of the military staff to convince the miners not to go over to the other side, threatening them with the militarisation of work, but to no avail. The risk paid off, but immediately after October 5th, it had turned into a threat. People remained on strike. Strike committees, which were set up in the first days of the strike in workplaces, achieved victory in their central demand – the right to the democratic election of the government. That, however, was just one of the demands. The new government, meanwhile, had different plans for these workplaces. 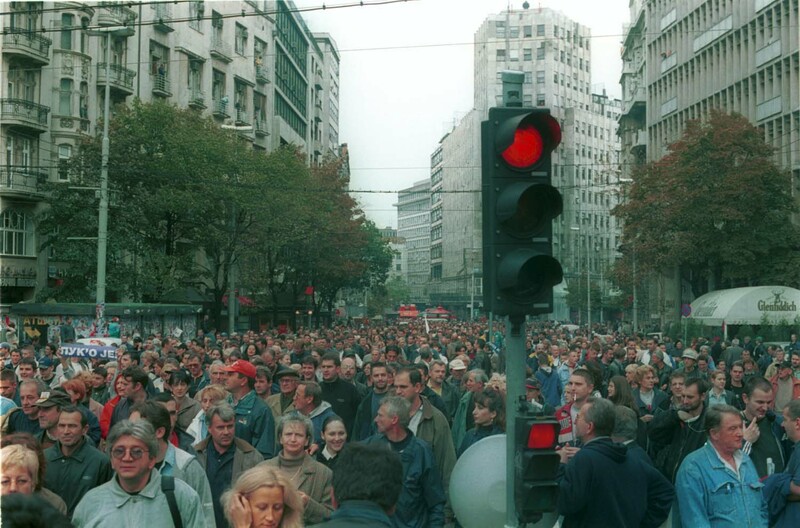 Vladimir Novaković, a participant in the strike Trudbenik construction strike, remembers those days. After years of parcelisation and restructuring, Trudbenik construction was sold to Monterra, a firm in the ownership of a financer of the Democratic Party, Nebojša Kopčalić. Not even a brick of the construction giant remains. In the week after the revolution, the British Guardian reported that Nebojša Čović, the then Đinđić confidante, was touring insubordinate strikers and trying to convince them to get back to work. The absence of an independent working class organisation, the lasting misery of the preceding years, and the co-optation of the unions into the logic of privatization – which was supported by the government, as well as the opposition – made certain that the initial resistance of the working class remained short-lived. Fixated on the ideas of market reform and the establishment of a state based on the rule of law, the new government managed without much effort to prevent the further development of the strike movement. The political, democratic revolution started and ended on the same day, while the social revolution was stifled at its roots. The bitter taste of tear-gas was soon replaced by the bitterness of the hopes placed in October 5th. Neoliberal restructuring, which the opposition had always offered as the medicine to ‘save Serbia from the madhouse’ – privatisation, strict monetary policy, deregulation and liberalisation of the market, all with the aim of attracting direct foreign investment – attracted almost exclusively speculative capital. The spiral of economic destruction was continued with the lowering of the value of various economic firms and their sale at below market prices to domestic tycoons and foreign capital. Around one million people ended up without work, which was defined as those still looking for work a year later. The public debt went through the roof and became the main mechanism through which international financial institutions and the great powers dictate to the domestic political scene in exchange for new loans. Privatisation and liberalisation, which were put into place by the democratic forces, were more decisive and far-reaching than Milošević’s, but they represented continuity in the belief in market mechanisms which had already sent the country through two rounds of devastating IMF bouts of shock therapy and which laid the foundations for the collapse of Tito’s Yugoslavia, the bloody wars that ensued, and the wholesale robbery of public wealth. The betrayal of the initial optimism pushed the people into a decade and a half of despair, distrust and cynicism towards any ripple of resistance coming from any group affected by the never-ending process of transition. That was obvious already during the time of the Đinđić government. In June 2001, the first legal regulations allowed for the privatisation of 4000 economic enterprises. The miners went on strike on the anniversary of the 5th October and won a raise. In December 2001, a former union leader, Dragan Milovanović was promoted to minister of labour, and he signed a labour law that allowed for easier firing. Changes to the labour law last year only furthered this liberalisation of the labour market. So it is naïve to attribute Đinđić’s popularity rating of 8% at the time of his death to bad media treatment. The reforms that he introduced went directly against the welfare of those without whom, as he himself said, he would have lost the battle of October 5th. Đinđić was succeeded at the head of the pro-European bloc by a series of unconvincing plagiarists who tried to maintain a balance between different interest groups, proclaimed aims, their own abilities, the East and West, all in an attempt to stay in power. In this period, the arch-enemy of the government was the Serbian Radical Party – an old regime, nationalist party that was firmly against the European Union. The Democratic Party electoral campaigns became ever less about the pre-election hopes prior to 2000, and ever more campaigns of fear aimed at the spectre of the past. Credit arrangements, the income from privatisation, and meagre investments were enough to ensure record low electoral turnouts, and in spite of winning the most votes, the Radicals were kept out of government for years – and from a share of the privatisation pie. People did not want to accept what was on offer, but they did not want a return to the old regime. Reforms continued to unfold at a speed that suited the tycoon financiers of the regime. A key turning point occurred when a couple of leaders of the Radical Party decided to change their tune and set up a pro-European and conservative Serbian Progressive Party. When they won the 2012 elections, many were surprised that Aleksandar Vučić allowed the position of the primer minister to go to a former spokesman for Milošević, Ivica Dačić, rather than himself. He took for himself the role of chief of the security apparatus. Liberals were deliriously expecting the Chetnik warlords and Milošević’s executioners to ‘take us back to the 1990s.’ But this did not happen. On the contrary, Serbia under this new government received its famous date for the beginning of EU entry negotiations. New credit arrangements followed, as did the continuation of legal reforms in the direction of privatizing remaining state property and further deregulating the labour market. In the economic sphere, Aleksandar Vučić is unequivocally continuing what Milošević had pointed towards and what Zoran Đinđić began, more successfully that many of the latter’s accepted successors put together. But that is not all. Vučić succeeded in what took Đinđić’s life, and Tadić’s reputation. What he did during the two years during which he headed the secret services will probably remain unknown until the next revolution, in which we should not forget to search the drawers and hard disks of Belgrade’s Street of Queen Ann. Still, one gets the sense that he got the job done. 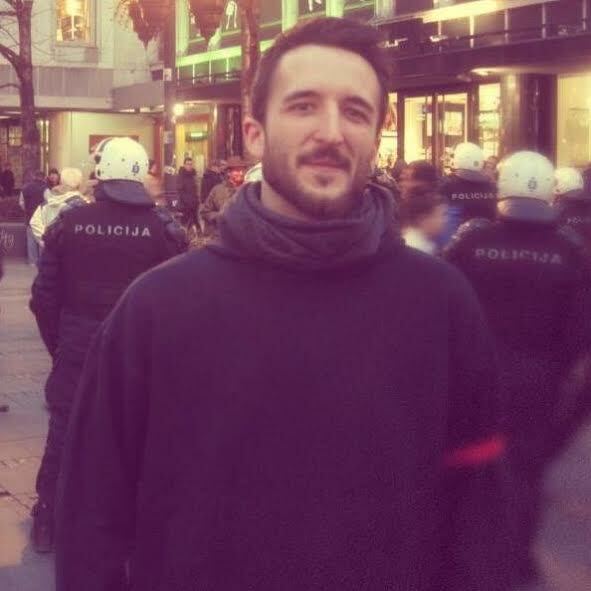 When on 10 October 2010, during the presidency of Tadić, a state of emergency was all but declared during the Pride march in Belgrade, everything was indicative of the fact that sleeper agents from the security services would use this opportunity to destabilise a pro-European government. According to witnesses from inside the Ministry of Internal Affairs, the police that day had a blindfold on. Communications with the secret services were dead. On the streets there was chaos. Groups of young people armed with stones were stretching the well-equipped police right, left, and centre. It is hard to believe that this was a revolt that was not organised from the inside. Although there is nothing to indicate that there has been a change in the perceptions of LGBT people among the football support groups [that spearheaded the violence in 2010, editorial note], the Pride marches held under Vučić’s regime transformed from an alleged battlefield between the pro-European and anti-European wings of the state apparatus into a spectacular display of state might. Instead of street battles, the armed vehicles and water cannons stood parked in near-by streets, as a warning to those who may think of anti-state activity. Control has been established. And even in this, Vučić has fulfilled Đinđić’s dream. We have become a normal capitalist country. That tells us one more thing, however. 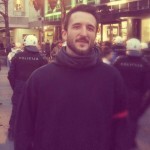 If Vučić’s politics really are no less pro-European than Đinđić’s or Tadić’s, if it really is possible to bring the behaviour of the secret police in line with the politics of the government, then the riots in 2010 were not ideologically inspired – and neither was Đinđić’s murder. Aleksandar Vučić is the best proof that Đinđić’s death was not a missed opportunity, but that his posthumously idealised vision was in fact a politics which never had the potential to live up to the hopes of those who wrote October 5th into history. That potential should be developed where, in the weeks following the revolution, it was so mercilessly suffocated in the name of reform. Svi citati su iz intervjua koji je desetak dana nakon Petog oktobra sa Zoranom Đinđićem obavila novinarka Vesna Mališić, a 2003. godine objavila u formi knjige, sasvim neadekvatnog naslova, San o Srbiji Zorana Đinđića. U pitanju je duži ekspoze o nastanku i sprovođenju strategije kojom je opozicija nakon godina neuspeha konačno srušila Miloševića. All citations are from an interview which was held with Zoran Đinđić ten days after the 5th October by the journalist Vesna Mališić, which came out in the form of a book in 2003, with the inappropriate title, ‘Zoran Đinđić’s dream for Serbia’. In fact, this is a longer tract about the hatching and then execution of the strategy used by the opposition to finally topple Milošević. Navedeno prema German L, “Serbia’s Spring in October”, International Socialism Journal, zima 2000. Cited in Lindsey German, ‘Serbia’s Spring in October’, International Socialism Journal, winter 2000. See for example the edited volume released by Zoran Stojiljković et al in 1999, Uloga sindikata u tranziciji [The Role of the Unions in Transition]. Sure, one more “revolution” by CIA script. Some people could not learn even on their own experience. And if you so much care about LGBT, ask USA to do to Serbia the same as they do to Saudi Arabia – you see, Saudi Arabia is a paradise for LGBT, because USA had made Saudi royals to do so.